narcotics trafficking. Even though Ulbricht, whose sobriquet was “The Dread Pirate Roberts”, is still presumed to be incarcerated a far more secure version of his Silk Road Website went back online November 6, 2013 and is still up today. And I know it’s still up because I have it open in another window as I’m writing this. 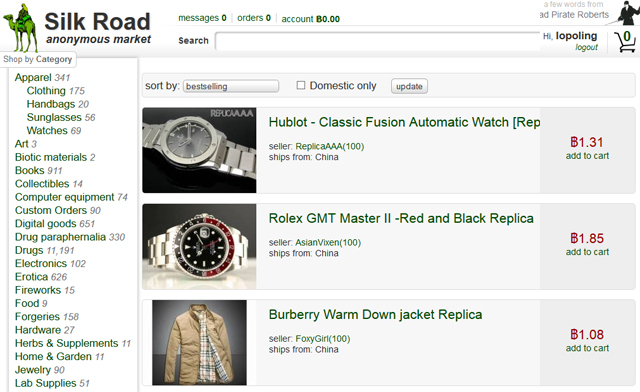 I’m sure you know that Silk Road is an online marketplace where some people buy and sell illegal drugs. Although I suppose if you live in Colorado or Washington it would be legal to both buy and sell marijuana using Silk Road but I wouldn’t ever advise it. But window shopping is not the same as buying and there is absolutely nothing illicit or dangerous about visiting the Silk Road Website. Another reason not to shy away from visiting Silk Road is that they sell a whole lot of other things besides illegal drugs and at some great prices too. For instance, you can buy a Burberry London Winter Down Jacket on eBay for $1,139.00. Nordstrom sells the same jacket for $1,795.00. Or you could buy one on Silk Road for a hundred and twenty-five bucks. Caveat Emptor, of course, but I wouldn’t be surprised if a Burberry London Winter Down Jacket knock-off from a firm called FoxyGirl didn’t turn out to be almost indistinguishable from “the real thing”. The only way you can buy anything on Silk Road is with Bitcoins. Bitcoins are easy to deal with if you use a site like CoinBase and here is a handy Bitcoin to US dollar, euro, Assie dollar, British pound and Swedish krona converter because Bitcoins fluctuate sometimes wildly in value. But back to the bargains on Silk Road. A decent pair of Ray-Ban sunglasses are going to cost you at least a hundred and fifty bucks. But you can buy Ray-Bans on Silk Road for thirty dollars. Of course The Dread Pirate Roberts sells pirated software too. You can buy MS Office 2011 from various Microsoft licensed dealers for about a hundred dollars or you could buy a full-blown licensed copy of Office 2011 on Silk Road for 20 bucks. The Ray-Bans? I say, go for it, but don’t buy pirated software. That’s stealing even if it is stealing from the evil empire. But there are tons of legal things to buy on Silk Road making it a very worthwhile visit. But how do you get to the Silk Road? That’s not as easy as you might think. Try Googling it. You wont find it because you can’t get there from here. The Silk Road is not on the surface Web, it’s in the Deep Web. In order to access the Deep Web where the Silk Road lies you’ll need to download and install the Tor Web browser. The Tor browser is very much like any other Web browser like Microsoft’s Windows Explorer or Google’s Chrome browser or Apple’s Safari Web browser. But Tor is an “onion” browser that routes your Internet connection through a worldwide, volunteer network consisting of more than four thousand relays to conceal not only your IP address but all of your activity on the Web. When you go into incognito mode on Chrome, IE or Firefox, you are by no means immune from detection. Your Internet Service Provider (ISP) is still logging every site you visit and monitoring everything you upload or download. But on the Tor Browser you are 100% invisible. With all the news about the intrusiveness of the NSA lately many people are beginning to do all of their Internet browsing with the Tor browser. Tor was, after all, created by the U.S. government to keep their online communications secure. But that’s for a different post. would any other software. You can download Tor from https://www.torproject.org/download/download and you don’t need to pay much attention to the precautionary material on the page if don’t intend to do anything illegal or provided you don’t live in a country that has laws forbidding access to Websites you might get in trouble for trying to visit on Tor. For instance, if you live in China or Iran you might want to run Tor inside a VPN or a Virtual Private Network. For those of us in Europe and the Americas who aren’t planning on breaking any laws, running Tor alone is all we need to do. instructions and you’ll be good to go. So have fun exploring the Bizarre Bazaar that is the Silk Road. Tor has very recently updated. Make sure you’re running the latest version of Tor. If you’ve recently updated Tor and are now receiving the error message: “Firefox is configured to use a proxy server that is refusing connections.” This issue is easy to resolve. The old version of Tor and the updated version should not be placed in the same directory. The simple fix is to create a new folder and drag only Tor-browser2.3.25-14en-US.exe into it and then run that file in the new folder and then the browser will behave perfectly. Of course you can and will probably want to delete all Tor related files outside this new directory. Some sites won’t behave as you’d expect them to with Scripts not enabled but that’s a small price to pay in exchange for total anonymity.